Some days ago, Tam at Righteous Orbs, called out to all bloggers to go to Argent Dawn (europe) and form a blogging guild. A place to hang out, and talk to each other. I thought about it, and I did like the idea, but the problem was, that with mu althoism, all slots where filled on AD, with alliance-characters, and the guild was horde. So I had to delete a character to join... in the end, Mendak, my very casual, non-heirloomed-priest, went the way of the dodo. Thusfar the /gchat has been lively, some nice discussions about C&C and Dune (old strategy-games), movies and other stuff. 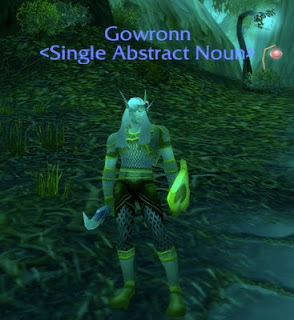 And of course I made a pally, called Gowronn. (well, Gowron ws taken... by myself). There are about 60 players thusfar. And on another note, it is very hard to find spellpower-leather with hit. It seems only the tier-pieces have it... that means my ilvl200-belt is very much needed atm. I culd re-gem, but a lot of gear is crosslinked to my tree-form.... oh well. Edit: Just read that on the US Argent Dawn, a sister-project is started with the same idea. Yeah, I have to second what Tam said - we are worth it /swishes glossy hair around.